Football was more than just Anthony Cephas’ sport since he was 10 years old. It was a way of life. He dreamed of a career in the NFL and even played wide receiver at Santa Monica Junior College alongside future pro greats Steve Smith and Chad Johnson. After Santa Monica, Cephas transferred to Tennessee State, but while there, a pair of knee injuries would quickly derail his football ambitions. Though one dream died, another sprang up to fill the void. These days, you can see Cephas showcasing his impressive strength and flexibility, performing captivating feats on a bar. He continues to enhance his repertoire of moves and build his stamina, but just two years into calisthenics training he well understands his work is cut out for him. Cephas, 35, goes by the stage name Bruce Leroy, inspired by the 1985 film “The Last Dragon,” in which a black teenager dreams of becoming a great martial artist like his idol, Bruce Lee. The types of muscles required of Cephas and his fellow competitors starkly differ from those of football players. As a result, Cephas had to change his mindset regarding how to train. Cephas discovered the emerging trend of advanced calisthenics on YouTube. In those videos, not too many of the participants lived on the West Coast; they were predominantly from Russia or New York. So, to get a flavor of the Los Angeles advanced calisthenics scene, he visited the 2010 LA Fit Expo, where he met Brendan Cosso. At the time, Cosso was showcasing the CrossCore (now known as CrossCore180), a pulley-utilizing bodyweight training system he invented that his business partner, Ken Gallarzo, jokingly calls “TRX on steroids.” Cosso and Gallarzo joined forces when they quickly realized that their interests were closely aligned and that their talents could complement each other’s. The realization was something like, “You’re doing bodyweight. I’m doing bodyweight. The difference is I’m using bars, and you’re using your pulley,” as Gallarzo tells it. For his part, Cephas got in contact with Cosso at the event, stayed in touch, began training in 2011 and has been progressing ever since. First, Cosso and Gallarzo decided to gather the calisthenics guys they’d spent time with in Venice for more of a formal competition. The event was a success. 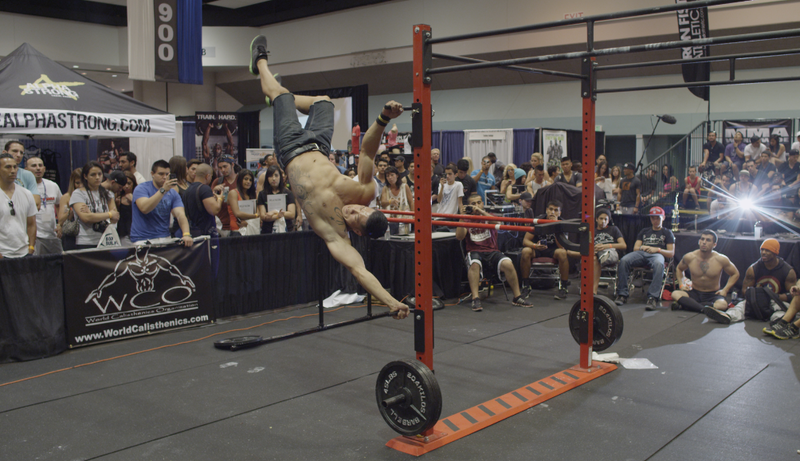 The name “Bar Wars” had already been taken by a short-lived British reality show and a bartending competition — both about bars of the alcohol variety — so they decided to name the event “Battle of the Bars” and took it to the LA Fit Expo. By 2012, Cosso and Gallarzo took the next step and founded the World Calisthenics Organization, which according to its mission statement “seeks to create healthy communities by promoting and providing the inherent benefits of Calisthenics exercise to all facets of society.” According to Cosso, he and his partner decided it was time to form a company that was going to cater to everything from education all the way up to competition. Cosso fondly remembers his junior high school days in the early 80s, part of calisthenics’ heyday, when students had to not only execute pushups, pull-ups and sit-ups, but also did dips and coordinated movements and used the peg board, pommel horse and more. 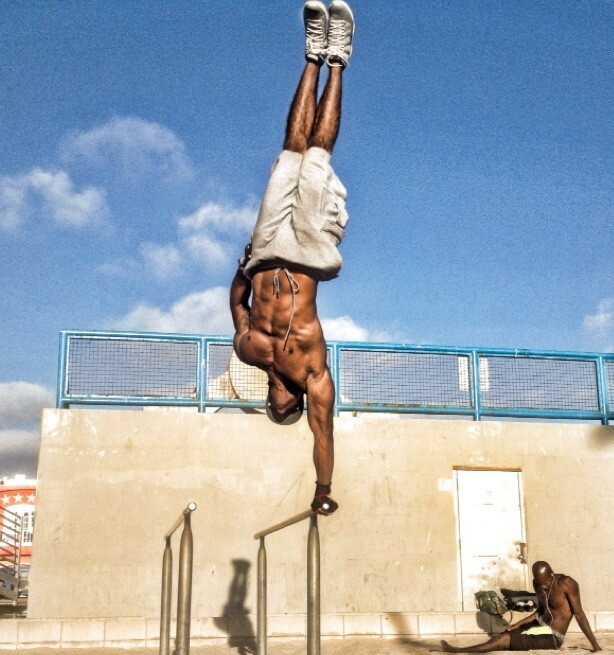 Cosso longs for the comeback of calisthenics and is surely doing his part by growing WCO, doing work in the community (for instance, they’re building monkey bars and other calisthenics equipment in 10 parks in Compton, Calif., this year) and popularizing Battle of the Bars events. The third annual Battle of the Bars will take place in Los Angeles on Jan. 25-26. The “knockout” was also added, by which the referee may eliminate a participant if it appears he cannot keep up with his opponent’s strength or endurance. Gallarzo, who believes the first knockout in World Calisthenics Organization history will occur at Battle of the Bars III, waxes poetic about the sport’s new addition: “Being an athlete myself and going through a lot of the movements, sometimes you don’t anticipate how much that something is going to be taking out of you. You can only do so much to prepare and in the face of trying to pull out all the stops, there just sometimes comes a point where you have nothing left. Cephas recalls going 1-on-1 at Battle of the Bars II and feeling like his opponent’s 20-second moves took a full minute to execute. 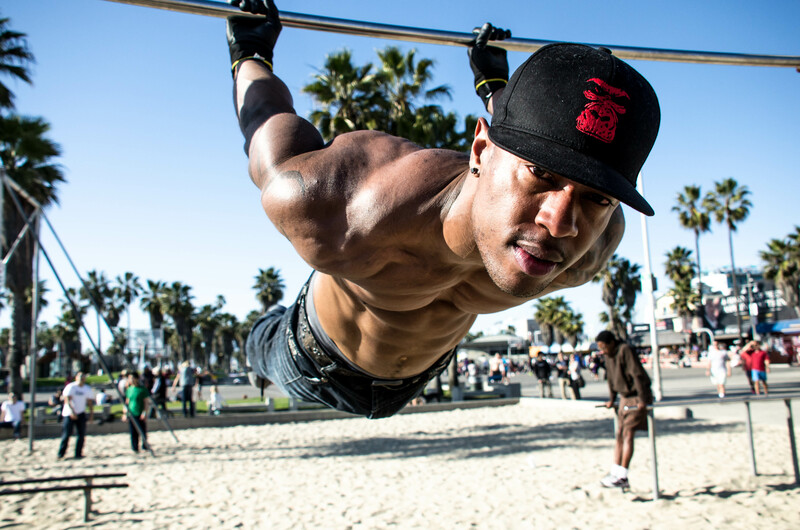 “Because it’s calisthenics, your endurance muscles, they don’t last long,” says Cephas. In football, the wide receivers, besides the kicker and punter, are usually among the smallest guys on the field. Cephas, however, is considered a heavyweight in calisthenics, weighing in around 200 pounds while a sizable number of his peers weigh less than 150 pounds. That’s why Cosso and some of the other organizers came up with “LeBar James” for Cephas’ new nickname. In other words, Cephas can do with his body what many of the smaller guys can do despite his additional size. The main guy whom Cephas mimicked on YouTube turned out to be 5-foot-7 and 125 pounds, and he had no idea. 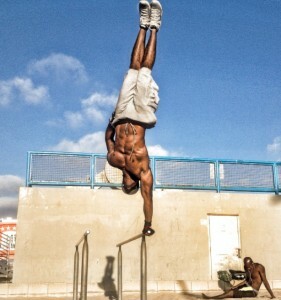 As with other bodyweight exercises, advanced calisthenics tends to be more difficult the heavier you are. In an effort to remedy that inequity, the WCO designates weight classes. But it’s never a perfect fix, because the weight class ranges depend upon which competitors (and of what size) are available for each event. The former wide receiver is currently perfecting a new move, which he expects to be ready just in time for Battle of the Bars III. It doesn’t have a name – like all of his other moves – but he’s very excited to unveil it shortly. Thanks to meticulous training, Cephas plans to take his sculpted physique – one that’s bigger than most of his competitors’ – and appear much lighter on the bar than he actually is. If the training pays off and his new maneuver looks as effortless as he hopes, he’ll take one more step to living up to his LeBar James moniker.